Hi, there music lovers! Merry Christmas! MYX will gather the country's best music artists during the MYX MO! 2012 tonight. MYX, the number one music channel in the Philippines proudly presents its annual music event, MYX Mo! 2012 featuring the biggest names in the music industry such as Rico Blanco, Callalily, 6Cyclemind, Sponge Cola, Chicosci, Kamikazee, Slapshock, Pupil, Moonstar88, Yeng Constantino and many more! Watch them perform live at the Marikina Sports Complex tonight, Tuesday, December 18, 2012. Those who have luckily claimed their VIP, Gold and Silver tickets through MYX’s promos must be at the gates before 4:00 p.m. 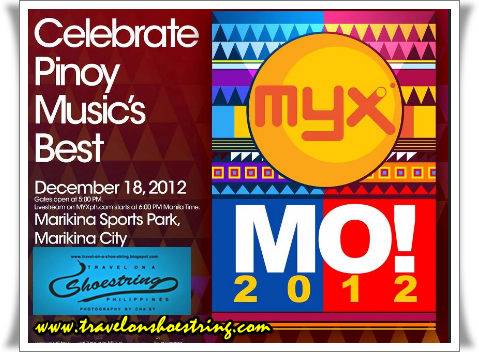 The most anticipated music event of the year, MYX Mo! 2012 will begin at 6:00 p.m. All music lovers around the world will also be able to watch the event by tuning in to the MYX Mo! livestream through MYX’s official website, www.myxph.com. Apart from the fun jamming sessions with your favorite Pinoy rock bands and singers, the lucky performer who will experience the limelight during the MYX Mo!ment Promo will also be revealed. MYX Mo! 2012 will be aired on MYX during these dates: December 21 at 7:00 p.m. to 1:00 a.m., December 24 at 1:00 p.m. to 7:00 p.m., December 25 at 7:00 pm to 9:00pm for the first part, December 26 at 7:00 p.m. to 9:00 p.m. for the second part and December 27 at 7:00 p.m. to 9:00 p.m. for the third part, December 29 at 6:00 p.m. to 12:00 a.m., December 31 at 10:00 p.m. to 4:00 a.m. and January 1 at 10:00 a.m. to 4:00 p.m.
For more information on MYX Mo! 2012 and its airing schedules, log on to to www.myxph.com. Also, download the MYX Charts iOS from the App Store and install it free of charge.